Dr. Meredith Bird is a graduate of Tufts University School of Veterinary Medicine. She is the president of the Wildlife Rehabilitators Association of RI and is active in the care of injured and orphaned wildlife in our state. 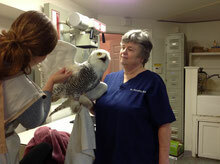 In addition to caring for dogs and cats, Dr. Bird has a special interest in exotic and avian medicine and surgery. As a child Dr. Bird lived in Japan, Nevada, California, Louisiana, Colorado and Germany, and has since traveled to Africa and other parts of the world. Prior to becoming a veterinarian, Dr. Bird's first career was as a nurse in the Navy during the Vietnam war. Dr. Bird is an avid horseback rider with a special interest in dressage and loves to escape to her Friesian horse, Romeo.